Thank you for the help you have gave me in locating a very special and unique picture that will be treasured by my husband forever. My husband, a former U.S. Marine Corps helicopter pilot, purchased a poster at an airshow in Maryland in 1995 of a Boeing H-46 Sea Knight helicopter flying over the Pacific Ocean. This is what he flew in the Vietnam War. He framed this poster and LOVED it. After moving several times this framed poster got banged up and needed to be replaced. He searched on the Internet off and on for several years with no luck and then forgot about it. Recently, our son, who is now in flight school with the Navy, called me and wanted to find this picture and give it to his Dad for Father’s Day. He told me to go look at the picture and find out the name of the company and the person who took the picture. I found “Cloud 9, Peter Mancus.” I Googled Cloud 9 and YOU were there!!!! I went to your website [www.cloud9photography.us] and found many great pictures, including helicopters! I looked and looked but my son gave me “all of the details” on the type of H-46 my husband flew. This must be a “pilot” thing, e.g., it HAD to be green, not tan, like the ones they are using today in Afghanistan; it HAD to have 3 wheels, not 4 . . . and on and on. Much too many details for me–“Mom.” So, I emailed CLOUD 9, not thinking that I would ACTUALLY get a response, and I had put my phone number down, too, which I never do . . . and, about 20 minutes later, the phone rang-- it was YOU! I was shocked- this picture my husband had been looking for and could not find, taken by YOU and there YOU were on the phone, AND wanting to help!!!! I am still so surprised. Our son decided that it would be better not to “surprise” Dad with his picture, so we got him involved so he could get exactly what he wanted. You and my husband spent a substantial amount of time on the phone, with you learning from my husband exactly what he wanted, before you said you were ready to search for the perfect picture for him in your photo archives! It did not take you as long as you estimated to find some pictures that might please my husband. We were pleasantly surprised when you called us back and told us that you had in fact found some beautiful H-46 pictures and then also described them over the phone for my husband. Thank you for making a prompt, diligent, effort to find what you thought my husband would want. You found at least 30 pictures and posted them on your website for him to choose from. You wanted him to get exactly what he wanted and your effort showed!!!!! With your help my husband was able to find a beautiful picture of a H-46 flying over the Pacific Ocean. The print you sent us is GORGEOUS, and he is soooooo happy. I do not know anyone who would go to the effort you did for just one picture for one person. I hope that other people will read this and know that you are truly one of a kind and that the service you have provided to us is outstanding, as is the picture you located out of thousands of pictures you have taken. We will always think of you when we look at this framed picture, and we will tell the story of how we (YOU) found it !!!!! You are a very special person Peter and it shows!!!!! "I came across the CLOUD 9 PHOTOGRAPHY web site by luck, as I was surfing around. I have since recommended it to others. It came as a delight to see CLOUD 9's awesome military pictures, especially the ones I can identify with from my time in the Corps. CLOUD 9 has an extensive site featuring truly amazing pictures of many historical eras. 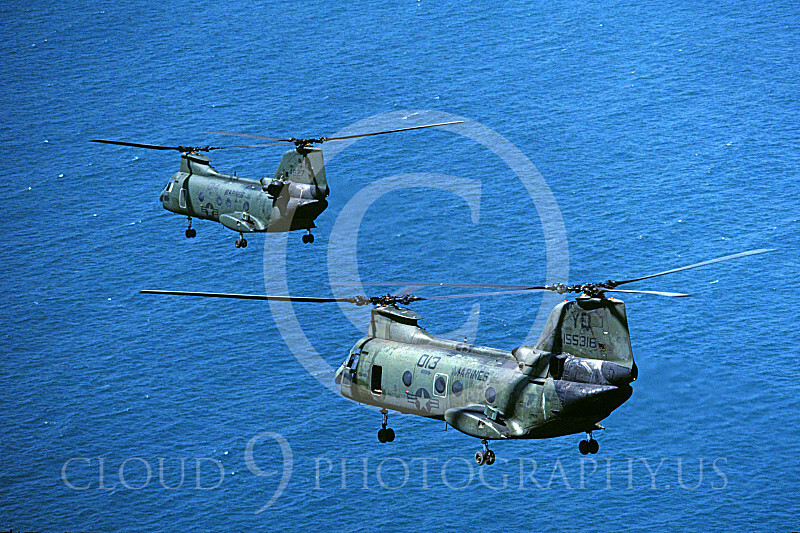 The picture I ordered from CLOUD 9 is of two Boeing CH-46E Sea Knight helicopters, in mid air, not doubt transferring some hard charging Marines to an unknown destination. What fond many memories came to mind as I saw my finished product, which is now framed and displayed front and center in my office. CLOUD 9 PHOTOGRAPHY is truly an awesome web site with very high quality products, prints, and an extensive selection of images. I would also like to add the pleasant experience I had in dealing with Peter, a true professional." -- Larry Hidalgo, Correctional Captain, Shafter Community Correctional Facility, Shafter, California. I am very pleased with my two CLOUD 9 prints [in-flight F-101B and F-106] that arrived this week. Before ordering them I could not have imagined that they would look as good as they do. I will order more prints in the near future. Thanks again. "I met Peter Mancus, Owner, CLOUD 9 PHOTOGRAPHY, at the Commemorative Air Force Airsho in Midland, Texas in October 2006. Peter told me about his love of airplanes, and much about his website. While I relaxed and watched the show, Peter was hard at work with three camera rigs and a tripod. I'm sure it's a labor of love for Peter, but he was working hard nonetheless. Peter told me of his commitment to quality and his willingness to reprint an order until it was absolutely perfect. I had told Peter that WWI planes are my favorites. He mentioned that he had a good air-to-air of a Fokker D.VII on his site, and I told him I would check it out. Before we parted company, Peter asked me to critique his site and be tough about it, which I did. I was impressed that Peter would do that. I truly believe that Peter is a perfectionist at all he does. I ended up ordering the D.VII print. It arrived in just a few days. Peter had emailed me that he held it one extra day to make sure it was dry. It arrived in a thick mailing tube with the ends well taped. I am 100 % percent satisfied with the print. I am amazed by the color. The lines are sharp and clear. The colors are rich and tight. At the Airsho, Peter had told me about the printer he uses. I would love to see it. Peter told me that he's spent a small fortune with Canon, and I believe it. I recommend CLOUD 9 PHOTOGRAPHY to anyone who loves airplanes. The variety of planes there is hard to find on any other site. Peter will ensure that your order is perfect." 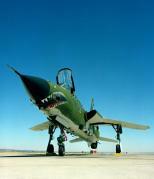 "As I was surfing the net I came across a picture of a yellow-tail F-4D. Imagine my surprise when it turned out to be my Phantom when I was stationed with the 80th Fighter Squadron ("Juvats") at Kunsan AB, ROK from 1977 to 1978. My backseater was 1/Lt Dave Garrison. The print arrived the other day, and is in for framing. I was very impressed with the quality—no errant pixels and very, very sharp lines. Thank you for reminding me of some good times in The Wolfpack: P-518, Nightmare Range (about 5 miles from the DMZ), Cope Thunder in the Philippines, and Ku Ni bombing range. 'Man has one virginity to lose in fighters, and if it is a lovely airplane he loses it to, there is where his heart will forever be.' Hemingway." "I ordered a couple of prints from Cloud 9 Photography and was very pleased with the pictures. Cloud 9 has a lot of subjects not found on other Internet sites. The quality and clarity of each print is impressive. They are printed on heavy paper and shipped in a nearly indestructible tube. I found Cloud 9 to be excellent to work with and would not hesitate to buy prints from them again." "The aircraft prints from Cloud9 are simply superb. The large selection and quality of images is unmatched by any other dealer on the web. The images are the product of a professional who clearly takes his profession seriously. Cloud9 captures those hard-to-find fighter squadron images that make you feel like you are back on the flightline. It's only a photo, but with Peter's skill, you can almost feel the heat from the afterburner." "My name is Jim Walker, I live in West Jordan, Utah. I came across the Cloud 9 website via a friend. I have never been to a website with this large of a selection of prints. 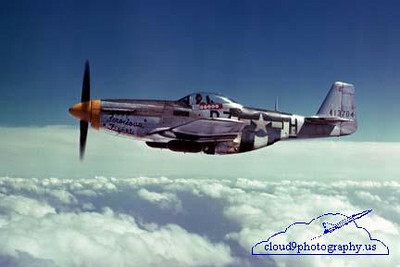 I ordered a print of an original photograph of a P51 mustang that was taken back in 1949. This is the most amazing picture I have ever seen! The quality of the print is perfect! I now have it framed and hanging in my den. I have spent a lot of time browsing through this website and I never get board. One of the BEST things about these prints, is how well the airplanes are captured at that moment, you can almost hear the engines roaring!. The static display prints are captivating and you can almost hear the angels singing in the background! Every picture has its own personality, which makes every print unique. To put it simply...I AM IMPRESSED! I can't thank Peter Mancus enough for the effort he has put into these prints. They are a treasure, Thank you." "I ordered from CLOUD 9 PHOTOGRAPHY a print of a Douglas C-47 in Turkish Air Force markings. CLOUD 9 sent me the print in an industrial strength mailing tube with end caps. I received the tube, with the print inside, in very good condition. I did not have to pay anything for customs to receive the print. This print is a fine study of a beautiful C-47, an historical airplane, in the markings of my nation's air force. I agree with CLOUD 9's owner, Peter Mancus, that I wish the photographer who took this picture used a sharper lens. Nevertheless, this print is acceptable. The airplane is clutter free, the color is rich and accurate, and it is 100% free of white or black specks, which I appreciate. CLOUD 9 PHOTOGRAPHY, thank you for your fine study, and your exceptional result of this beautiful C-47." "I've been involved in aviation for most of my life, and over the years I've accumulated a large collection of aeronautical artifacts. Among the photographs some of my favorites are prints by Peter Mancus. The subjects are usually captured in unique poses and the clarity of detail is often stunning. Currently, I am doing research for a book about a rare aircraft, the Temco TT-1 Pinto, and Cloud 9's photos provided me with some of the most visually interesting images of this type that I have ever seen." "Saw a picture of an old U.S. Navy C-118 on the CLOUD 9 PHOTOGRAPHY Internet site. This C-118 was one of the actual planes from my air squadron of about forty years ago as a sailor with VR-21 at NAS Barbers Point, Hawaii. I ordered a copy and was quite impressed with the detail and quality of the photo. I had it matted and framed and it is now prominently displayed on my office wall." "... the best that I've ever seen ... outstanding images ... at reasonable prices." "You would not BELIEVE this guy's camera gear. And the PRINTER! Dear lordy on his heavenly throne, it's this big crazy monster. The quality of these prints is just off-scale." "A superb product. How nice to know that all the world's great and historical aircraft are now living on Cloud 9!" "... your photographs are the best I've ever seen!" "Terrific quality. I couldn't believe my eyes." "I have just received my print of the Ferocious Frankie that you did for me. I am very much satisfied with the looks of it and also everyone in my office says that it is a wonderful job.... Thank you again for your expert work and very fast service. I will recommend you to other people I come in contact with." "Your in-flight photos exceeded my wildest expectations." "I received more than my money's worth." "... what a delight! ... excellent! ... absolutely superb, masterful shots. I am very happy." "Your vast and growing collection is the best ... ."
"You have the most impressive in-flight photos I have been able to find anywhere." " ... they are the sharpest, most brilliantly spectacular aircraft photos I have ever seen." "I've got the set of photos laid out in front of me, a grin spread across my face as far as it will go, simply awed at the quality, clarity, attention to framing of the subject and just overall brilliance of your photos... . These prints are phenomenal." "Frankly, I'm astounded! ... Detail was crystal clear." "Excellent! Your operation is first rate!" "I like perfection and your prints are excellent." "... color reproduction is excellent ... selection is quite impressive." "... ideal for collector and modeler." "CLOUD 9 is the best in both clarity and quality." "Your photo on the cover of January's AIRPOWER is the most impressive F-105 shot I've ever seen." "... I'm gonna tell a friend. Keep up the good work." " ... all of your work so far has been of excellent quality, exactly as advertised." "I can highly recommend your work to anyone. All the photos I received were of the highest quality ... ."
"The color prints I received from you are excellent." "The photos you sent me were superb ... each print was clear and defect free." "The quality of your prints is unsurpassed. The lighting, range of colors, and finish are excellent." 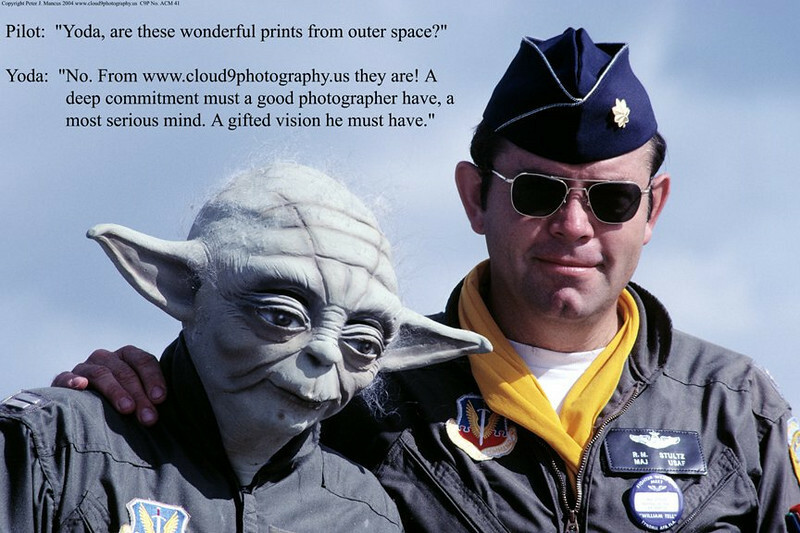 "I wish I had known about CLOUD 9 PHOTOGRAPHY when I was writing my F-14 and F-15 books. I know the books would have been enriched visually with the caliber of work that you are producing." "Your aircraft prints have got to be some of the finest (if not the finest) I have yet seen and I have seen thousands ... . I couldn't believe how sharp and really clear they were for being as old as they are." "We received the prints in perfect condition in those super-heavy-duty mailing tubes. The quality of the print was just astonishing. We sat there saying 'Wow!' over and over. Thanks!" But don't take their word for it! You owe it to yourself to fly with us at least one flight. We are so confident that you'll love our prized photographs that we offer a no questions asked, money back guarantee: the sale is not final until you actually see the photographs and accept them! Less than one tenth of one percent of our customers ask for a refund! That is "quality control."